The Agents of Shield dropped by my home state of Pennsylvania last night! Unfortunately it was because a guy’s brain exploded with electricity caused by an alien disease contracted from a Chitauri helmet (the bad alien fodder in the Avengers if you don’t know who they are). Anyway that wasn’t really much of a spoiler because the real juice of the episode lay in the near death of one of the Agents. The overall plot of the story didn’t move forward very much at all but it had more emotional gravitas than any episode thus far. I felt a tad bored as a viewer until the writers flipped the powerful character moments switch to ON. This happened immediately when Coulson (Clark Gregg) refused to leave the side of an infected first responder who was going to die in moments. He attempted to calm him and told the man about his own near death experience stating that he saw something more when he died and it was, ‘beautiful’. That was just the opening gambit of the episode though as it was Agent Simmons (Elizabeth Henstridge) who was infected with the alien virus. She then spent a good bit of time trying to cure herself with the aid of Fitz (Iain De Caestecker) . The chemistry between the two was amazing in the episode and they should both be given some kind of awards. 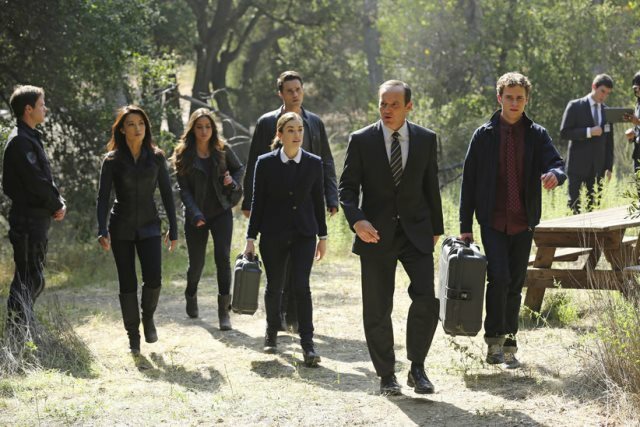 That said the undisputed best moment of the episode was when Fitz was going to jump off the plane after Simmons, who was trying to give the team a safe distance from her exploding body, only to have the parachute taken by Ward (Brett Dalton) who leaped out after her without any hesitation after giving a speech to Skye (Chloe Bennet) about waiting to be needed. It was a very cool and amazing moment. I think I’m still recovering from how much my blood pressure rose watching this roller coaster of an episode. I’m just happy the beautiful and amazing Simmons is still on the show and not a victim of Joss Whedon’s murderous ways! Just kidding of course, Whedon has a reputation for killing characters but he’s actually pretty tame when it comes to doing it. This episode did a great job of making me think he might off Simmons even though all my rational story telling predication abilities were telling me it would never happen. So the episode ended on a happy note with Simmons cured and Ward revealing he knows everyone makes fun of him but is actually amused by it. There were few if any Marvel easter eggs spread throughout the episode and that’s always a bit of a bummer but that wasn’t really the point of the episode. Although Coulson’s blood work was ‘high in iron’ (cough life model decoy cough). My only complaint is that this is the second episode to feature them trapped on their airplane for an extended period. I’m more interested in plots that span different locations and deal with adventure. I’m hoping the mantra for season two is less plane more marvels. Secondly I’m still waiting to see a super power not drive someone insane or be horrible in some way. Oh and why is it reinforced every episode that Coulson is different or that he’s having issues with Shield. I love that story but I want to see some development. He just seems to keep having the same conversations with people about it; this is excluding his great monologue to the first responder which felt very fresh and unique. Agent Blake (Titus Welliver) was a pretty cold antithesis of Coulson though. Fury’s cameo was more funny than serious but Blake seemed to be really threatening Coulson and the moment where he rubbed Lola on his way out drilled home the point that Blake and Coulson could easily be real nemesis down the road a bit. I’m figuring when Coulson realizes Shield isn’t as noble as they seem or when Shield decides to neutralize Coulson. That’s all for now! See ya next week, hopefully it ties into Thor: the Dark World some how!